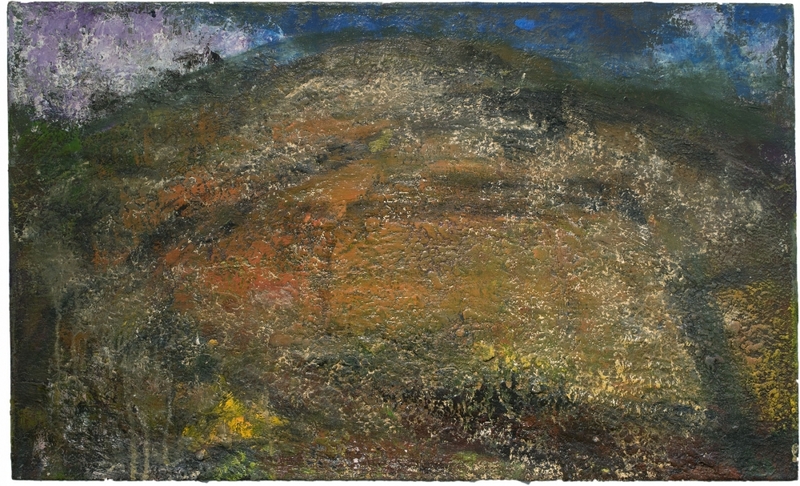 Like the fabled American nineteenth-century artist Albert Pinkham Ryder, John Lees often works on his paintings for years, even decades, overlaying the canvases with what the French call “couches” of pigment (a word relating to “couch” in English—to lay down on). And he modifies, eliminates, paints over, peers at, thinks about, thinks more about, changes again, scrapes, puts aside (facing the wall), looks at yet again, adds more paint to, further edits, revises, and so encrusts the surfaces in a richly heavy and sometimes bumpy or gravelly, sometimes willfully crude, scumbled textures that may glow with colors both luxuriant and subtle from beneath. So these paintings age with him. For drawings he may add panels as he scours and redraws and radically changes compositions. Lees’s canvases and worked over drawings literally partake in and show the vicissitudes of the passage of time. With their fresco-like effects many seem to be artifacts from antiquitythat have marvelously, even heroically, endured. Whether a landscape, a picture of a dour old man, buildings, or the title of an old movie writ large, each work, in part through the accretion of paint and its own range of tonalities, emits its own special aura. One repeated motif in the current exhibition is that of a bald old man, Lees’s father, an ever so slightly comic but melancholic figure, a sort of cartoonish stumblebum seated in an unprepossessing easy chair in a dark, somewhat airless interior. With superb visual intelligence, Lees invokes his own personal mythologies, the figures with which he grew up: he pays heartfelt tribute to Porky Pig, from animation; or the naïve and awkward boy puppet Dilly Dally, with whom he identified (from the popular Howdy Doody show, 1947-60). His celebratory images are often very American in their references: the strains of mellow jazz from a sax, cartoons, Hollywood films. But however varied the subject, these paintings are deeply considered, the antipodes of glib. Through the density of their presentation they become meditative, contemplative, themselves iconic. At a recent public lecture at the New York Studio School (where we both teach), the self-deprecating Lees spoke with winning familiarity, simply and marvelously informatively as well as eloquently of his background in art and of his methods. Early on he was taken by the work of Georges Rouault, the seriousness and density of that of Milton Resnick, the work of Chaim Soutine. He also gave a spirited description of his experiments with technique including flicking gobs of paint on canvas, on furniture (yes, an arm chair such as he has had his father inhabit and the subject of other paintings by him), and a rug; and painting thickly enough to enable him to excavate forms—a fish—on the worked up surface. All this described with a gentle, sweetly comic and endearing humor. After he came to live where the landscape was important, he made that the subject of his work, having carefully looked at Chinese landscape painting. And it shows. With all but offhanded seeming charm and lack of pomp, John Lees manages to establish strong presences and worth in the most unassuming and unexpected images. He pays tribute to the least presumptuous or ladida and renders them for the ages. He knows how to create even via the most transient of subjects, a sense of wonder, the transcendent, and gravitas.